Soil is a key foundation for life and an only conditionally renewable resource. It fulfils a variety of functions necessary for existence. For agriculture, the fertility of soil is a decisive factor. However, soil and agriculture do not just impact on each other. Soil is also of particular importance for protecting water, air, climate and biodiversity. Nevertheless, more than ten million hectares of arable land are lost globally to other uses every year. The loss of arable and ecologically varied land worldwide is tremendous. Reasons include desertification due to climate change, erosion from extreme weather, degradation as a result of industrial contamination or simply being covered in concrete for streets or settlements. According to UN assessments, some ten million hectares of arable land are lost annually. 3.6 billion hectares – or an area larger than Africa – are already affected by desertification. A billion people stand to lose the fundamental basis for their livelihoods. The UN’s 2030 Agenda includes an important development goal related to soil (SDG 15): “Halt and reverse land degradation” For the year 2030 the goal calls for us to restore ecosystems on land and support their sustainable use, combat desertification, manage forests sustainably, halt land degradation and halt biodiversity loss. In order to raise awareness for the topic of soil conversation among the broader public, during the 2015 International Year of Soils the Council for Sustainable Development joined forces with the German Federal Environmental Foundation (DBU) and ahu AG to hold the “BodenWertSchätzen” (Valuing soil) competition and honoured 158 projects for their outstanding engagement. Around half of our country’s land is used for agricultural purposes. Worldwide, this figure is about 38 per cent. Organic farming supports protection of biodiversity, puts less of a burden on groundwater and the climate and prevents soil overfertilisation. It is essential for protecting soil as a resource. The German Sustainable Development Strategy and Biodiversity Strategy thus stipulate that by the year 2020 farmers in Germany cultivate 20 per cent of their productive land on an organic basis. Much is still to be done, however, as in 2015 the share was just 6.5 per cent. In order to reach the goal set by the federal government in the foreseeable future, the Council has called for a number of reforms: obstacles to expanding organic farming must be identified and eliminated. Farmers need legal security, and at the EU level, a new regulation on organic farming has not been forthcoming. Interim plans of the European Commission to review the organic farmers’ end products rather than the process of organic farming resulted in a great deal of uncertainty among farmers. The Council further calls for organic farming to be made more efficient: production methods need to react to climate change and resource scarcity, the farmers’ contribution to environmental protection should be rewarded and the competitiveness of farming businesses should be enhanced. The EU Common Agricultural Policy (CAP) is a key control instrument. It governs how the agricultural sector impacts on the environment. Environmentally friendly agricultural practice is essential. This is the only way we will be able to ensure that future generations, too, will have a stable foundation for their food production. In Germany as well, too much land is being built on. Over the last 60 years, the land area taken up by settlements and roads in Germany has more than doubled. According to data from the Federal Statistical Office, in 2015 an area of 66 hectares was newly designated for development (2014: 69 hectares) – usually at the cost of arable land and agriculture. This loss of usable land is one of the largest mortgages we have signed on behalf of the future. Using land sustainably is a complicated topic, however, as a variety of sectors are in competition for the land as a resource: agriculture and forestry, settlements and transport, nature conservation, raw materials extraction and energy generation. Economic and responsible land use is also an indicator of urban and rural areas developing sustainably and protecting soil resources. The Council has made numerous suggestions as to how land can be used intelligently and sustainably. Back in 2004 the Council published the guide “Mehr Wert für die Fläche: Das ‚Ziel-30-ha‘ für die Nachhaltigkeit in Stadt und Land” (More value for land: the 30-ha goal for sustainable development of urban and rural areas), which remains highly relevant today. The idea then was to do away with the tax deduction for distance travelled to work, to change the homeowner deduction and land tax such that they promote buying of real estate in inner-city areas and the redensification of cities instead of greenfield development. These ideas and recommendations remain applicable today. The national Sustainable Development Strategy originally foresaw consuming a maximum of 30 hectares of land per day by the year 2020. It is becoming apparent, however, that this goal will not be reached. 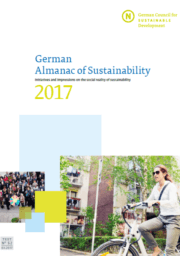 The German Sustainable Development Strategy from 2016 has thus been amended and stipulates that additional consumption of land for settlements and transport is to be limited to under 30 hectares per day by the year 2030. This is a key step on the path to achieving net-zero land consumption by 2050 and sustainable development overall. The “Sustainable City” dialogue, led by a group of mayors from around Germany and facilitated by the Council, provides key contributions towards achieving sustainable urban development and land use policies at municipal level.